thankyou.jpg. Well this is the most current thing on Scottgames... I'm not sure how to feel. All I want to say really is "No, thank bạn Scott". HD Wallpaper and background images in the Five Nights At Freddy's club tagged: photo go on visit the website. 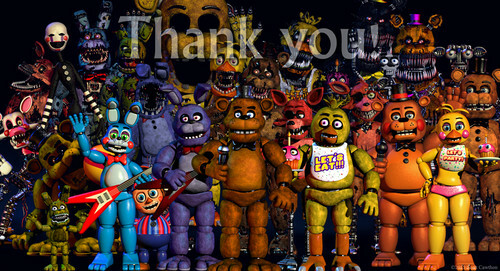 This Five Nights At Freddy's photo might contain anime, truyện tranh, phim hoạt hình, and manga. No, thank YOU, Scott. Without you, we wouldn't have this amazing community, these amazing games and i would probably forever love things that are meant specifically for children.